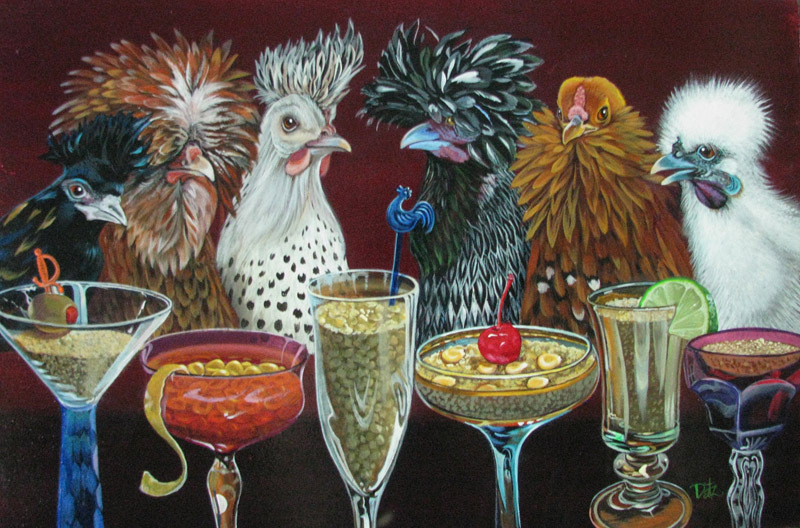 At her annual summer art show, artist Margot Datz explores the theme “Party Animals,” a playful look at the ways we celebrate our lives, she writes in a press release. 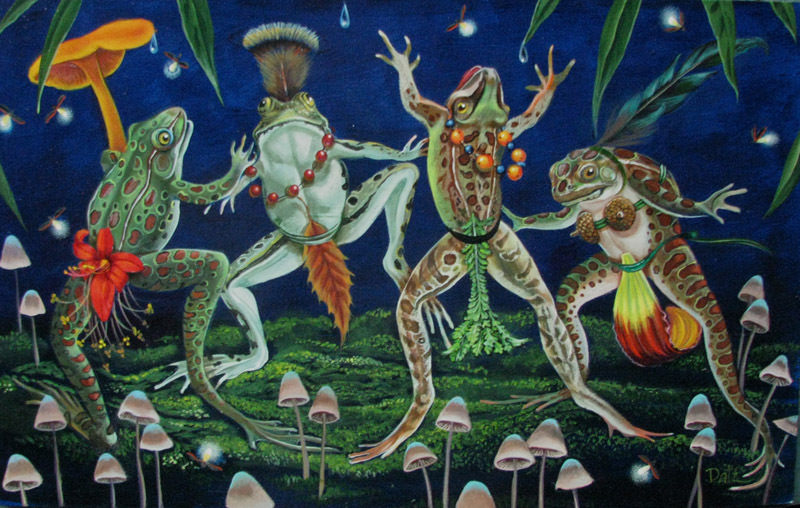 Frolicking frogs, fancy chickens, and masked raccoons live inside these picture frames, opening a window into the fantasy world of the artist. Datz accompanies each of her paintings with a brief note that gives the audience access to her work’s meaning. “It’s like having an open house, only it’s an open brain,” she says. “People can come in, walk around, peek in a closet or two, and see my view from inside of me. 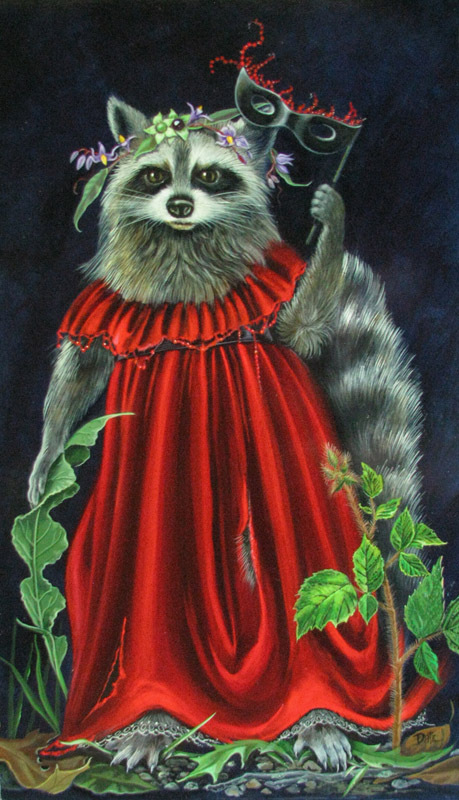 It is rather intimate, a little scary, and very rewarding.” Some viewers prefer to read her writing first, others to view the painting first; the two fuse together into a unique experience. Passionately devoted to the creation of public art, Datz says her goal is to communicate with people. Her many murals include those at the Old Whaling Church, the Martha’s Vineyard YMCA, both ferry terminals, the Martha’s Vineyard Hospital, the Oak Bluffs Children’s Library, and now the 65-foot mural of coral reefs around the world at the Edgartown Children’s Library. She is in the process of creating panels for the Chilmark Children’s Library, based on the work of Thomas Hart Benton, which will be completed this fall. Datz’s show, for one night only, is Saturday, August 4, at the Grange Hall in West Tisbury, from 4 to 8 pm. Previews are available by contacting margotdatz@gmail.com. Datz will also share her limited-edition signed prints at the event.